Quick connect couplings offer a convenient 'Push-Twist and click' connection that provides a positive locking condition while connected. The strong steel cable hose restraints help prevent hose whip in case of accidental seperation of coupling or clamp devices. 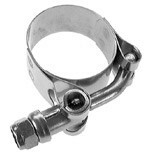 We offer heavy duty hose clamps with a rugged, plated mallaeble iron two-bolt clamp with machine and hex nuts. Offering worm gear clamps that have stainless steel band and housing with stainless steel screw. Hydraulic pipe fittings are manufactured to the requirement of ASTM A-351 with basic dimensions in accordance with ANSI B 16.3/150lbs.